Cover and cook on Low heat setting 9 to 11 hours. Remove beef from cooker; place on cutting board. Cut beef into slices. To serve, spread 1 tablespoon dressing on each toast slice. Using slotted spoon to remove sauerkraut from cooker, top 8 slices toast with 1/2 cup sauerkraut each. Top sauerkraut with beef slices and cheese slice. Top with remaining toast. Note: This recipe was tested in slow cookers with heating elements in the side and bottom of the cooker, not in cookers that stand only on a heated base. For slow cookers with just a heated base, follow the manufacturer’s directions for layering ingredients and choosing a temperature. These sandwiches cry out for a good garlic dill pickle, purchased German potato salad or crunchy potato chips and a side of deli slaw. 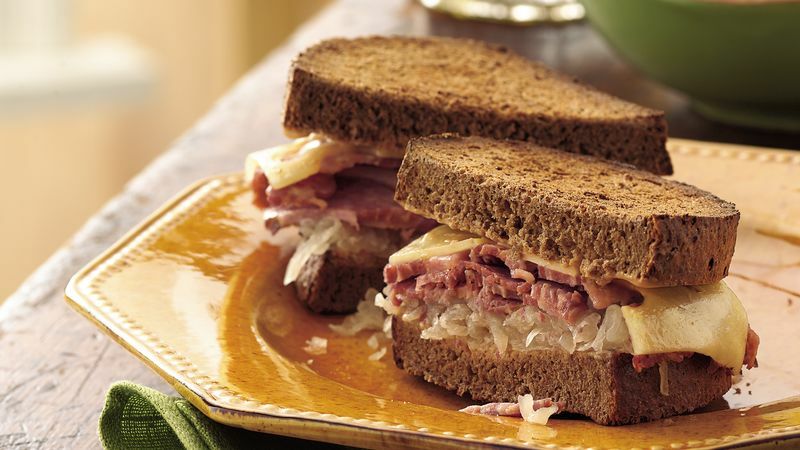 To make this a portable potluck sandwich, stir the sliced beef into the sauerkraut. Place the dressing in a squeeze bottle (like for ketchup), and set out a basket of rye buns and smaller slices of Swiss cheese to make it easy for guests to make their own sandwiches. Need a hearty party snack? Build the sandwiches on slices of party rye for a three-bite treat.